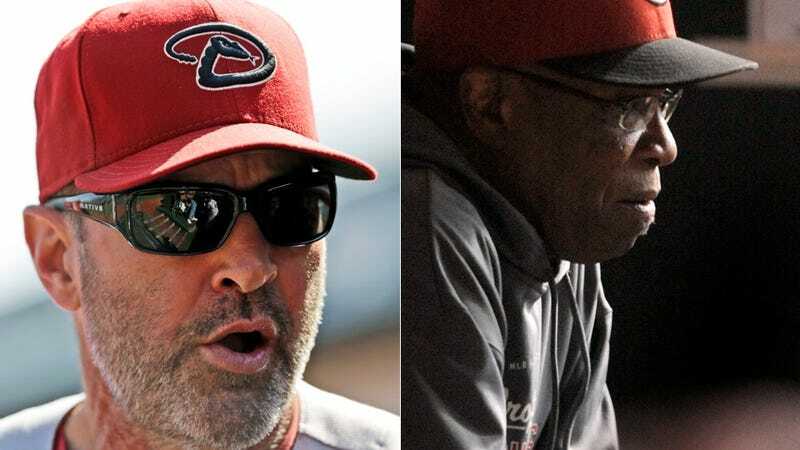 We're still more than three weeks from the start of the MLB regular season, but that completely nonexistent heated rivalry between the Diamondbacks and the Reds is already starting to simmer. Yesterday, before their Cactus League cage match, managers Kirk Gibson and Dusty Baker met at home plate to exchange lineup cards. But they soon began shouting at one another. Eventually, Gibson extended his hand, offering to shake Baker's. Baker refused him. Turns out Baker wanted to use Shin-Soo Choo as a designated hitter, but that Gibson wouldn't allow it. In Spring Training, it's up to the home team — in this case the D-backs — to decide whether a DH is used or not. "I had it happen last year with a team, they tried to put the DH in there and that's not the way it's done," Gibson said. "I wanted to play a National League game. I notified them several times and they just wanted to do it their way and they couldn't do it. So they didn't like that. But we play by the rules here, that's the way it is. We go over there we play by their rules. It's very simple." Baker would only say that he and Gibson "didn't have a very pleasant encounter at home plate," and that "it's over." These guys know these games don't count, right?